“You see some phenomenal things under a scanning electron microscope,” says Kilean Lucas. 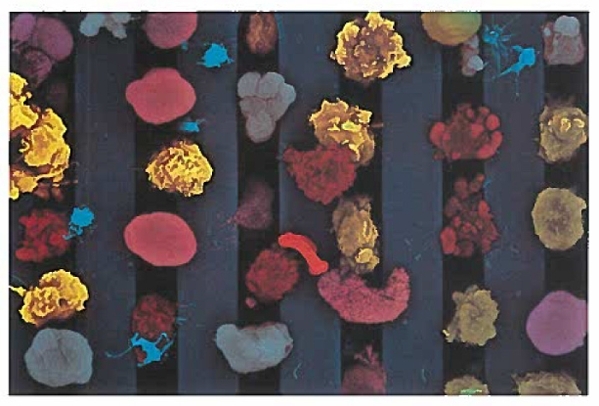 Such as the image above, which the PhD student took of a single human red blood cell, captured among several white blood cells on a silicon nanomembrane developed in the lab of Lucas’ advisor, James McGrath, professor of biomedical engineering. Lucas is studying how the ability of these nanomembranes to separate and filter out particles that differ by mere microns in size could lead to medical breakthroughs. For example, immature red blood cells separated from mature red blood cells could be harvested and seeded into bioreactors as a new way to replenish blood banks. Or all the white blood cells could be filtered out from a patient’s blood sample. There are many forms of white blood cells, each responding in different ways to different threats. The proportion of each type of white blood cell in a given sample could be used to give a rough diagnosis of the body’s response to disease. He hopes this image will convey to people how “stunning it is, in and of itself, that we’re able to capture all of these cells out of blood, a very complex solution” – in ways that could change peoples’ lives. Read more about this year's Art of Science Competition here.